I was at Maker Faire Bay Area this weekend. One of my favorite things was a collection of simple handmade puzzles sitting on a table under an umbrella, away from the action. A Russian woman named Tatiana Ginzburg told me that the puzzles were part of some kind of mind enlightenment group she started. When I got back home I looked her up and found her website, Global Enlightenment. I picked up the puzzle shown in the photo here. 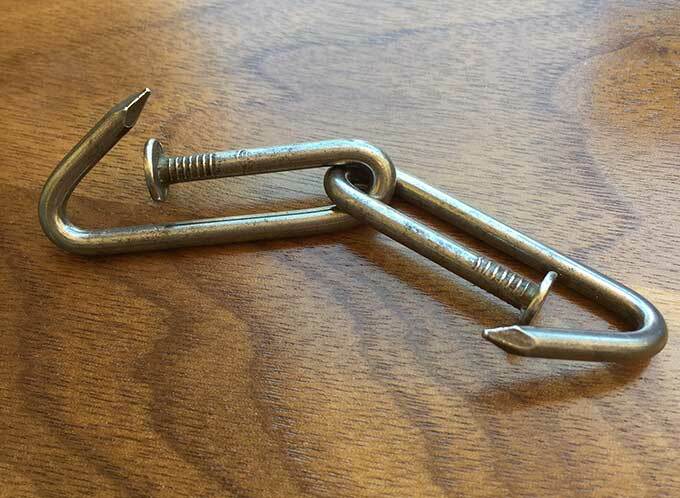 It's two nails, bent in such a way that the nails are linked. I spent about 15 minutes trying to disentangle them. I bought it for $10 and as I was walking away from the table, accidentally separated them. It took 15 minutes of trial and error to get them linked again. I spent the rest of Maker Faire fiddling with them. Every hour or so I was able to get them apart, but I didn't know how I did it. Last night when I got back home, I stayed up late and finally figured it out. I can get them unlinked in a few seconds. I still haven't figured out how to easily get them back together. I'll work on it tonight. I love this thing. I don't know where you can buy this exact kind of nail puzzle. This one looks similar, though.